The last thing I need is a new deck of cards, but that didn't stop me from walking into Barnes & Noble last week and leaving with a brand new set of Guardian Angel Tarot Cards. They are amazing, I have no regrets! My sister asked if they were different from the others I have. Yes and no, but mostly yes. The deck is based on the standard structure and themes of tarot, with 21 major arcana cards to illustrate big life changes and four suits of element cards to guide us through the details of everyday life. 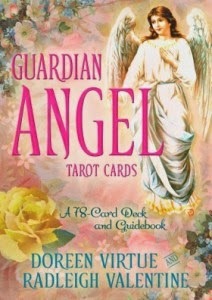 What I love most about the Guardian Angel Tarot, by Doreen Virtue and Radleigh Valentine, is that the messages and the images are peaceful, angelic, and obvious so that the point is clear. My grandmother would love this deck, when others would might raise eyebrows. They are that gentle. I also like the way they've translated the Suits of Pentacles, Wands, Air and Swords into what they represent in our lives: Abundance, Action, Thought and Emotions. All of the cards are illustrated in such a way to make them obvious and less prone to misinterpretation, especially by newbies when it comes to tarot reading. A great example is the very first card in any tarot deck: The Fool. In traditional tarot, the Fool shows a young boy walking off a cliff, his trusty dog following him and alerting him to the potential danger of a big fall. The kid however, is following his passions with so much enthusiasm that he hasn't a care in the world. The card can usually be interpreted to say that a leap of faith is required at the moment, and the dog is the guardian who is there to make sure we don't commit a great folly (so take a leap!). In the Guardian Angel tarot, again we have a young boy near a cliff, only he isn't jumping off it. Instead, he lets a butterfly take flight and his guardian angel is right behind him, making sure he is safe and supported. 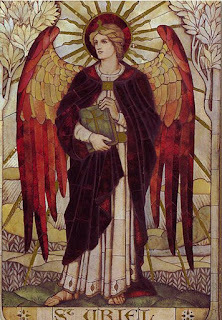 The message is the same though it also reminds us to rely on our angels. It's gorgeous, you'll love it! Helper of Abundance: Although I have lots to do, it's important to get organised. Once the planning phase is complete, get to work! This is especially helpful right now as I have tons of ideas and I should prioritize. Traditionally the Knight of Pentacles. Guardian of Thought: I may be called on to be a spokesperson for a cause close to my heart. Finding a mentor will help catapult my plans too. To me, this card is about strategizing and focusing my efforts where they will have the strongest influence. I need to give this some more thought, especially as opportunities arise. Messenger of Action: Something exciting in comes to pass in my career. I'll be excited to learn and grow, even if it also brings nervous energy. This card is often about responding to a request, a suggestion or a new opportunity that presents itself. The messenger cards also tell us that we'll get to cut our teeth on a new endevour, possibly requiring a new but exciting skill set! This deck is lovely and I'm still getting to know it right now. I'll be practicing with free mini readings over the next few weeks to familiarise myself with the cards and their messages. Join me on Facebook or Twitter to request a mini reading, just keep your eyes peeled for the Angel Reading Hour. Thank You! Get your own deck on Amazon!